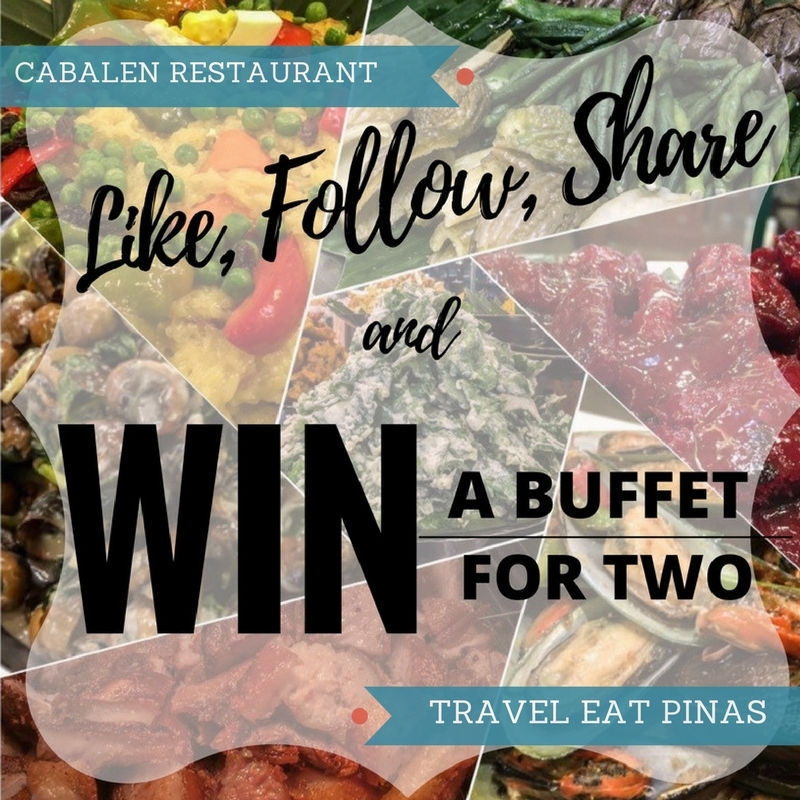 In celebration of Cabalen Restaurant's three decades of providing traditional Capampangan dishes and specialties to Filipinos, Travel Eat Pinas and Cabalen Restaurant is giving away TWO BUFFET PASSES to ONE LUCKY WINNER this MARCH! Joining the contest is easy. All you have to do is Like, Follow and Share. LIKE Cabalen Restaurant and Travel Eat Pinas FACEBOOK PAGE. FOLLOW Cabalen Restaurant and Travel Eat Pinas INSTAGRAM PAGE. 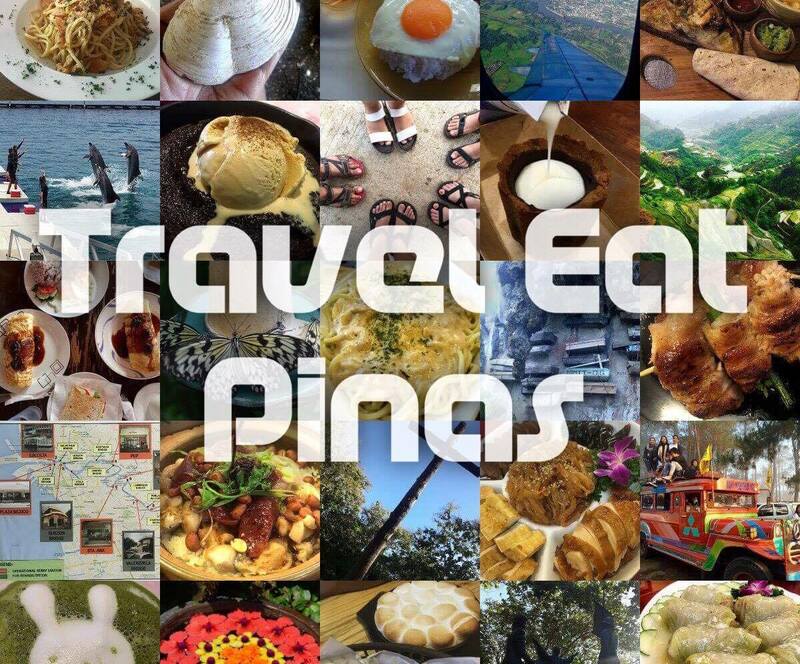 SHARE this post https://www.facebook.com/traveleatpinas/posts/1425431750862598:0 on your facebook account. Tell us why you want to win the buffet passes and tag three (3) of your friends on your post. Make sure that your post is in public and don't forget to use the hashtag #TravelEatPinas #Cabalen3Dekada #TrEaPhSaCabalen. The most creative reason will win the buffet passes. The lucky winner will be announced on March 27, 2017, at Travel Eat Pinas Facebook Page. The winner will claim his or her buffet passes at Cabalen Restaurant Head Office located at 54 JP Rizal Street, corner Aguado Street, Project 4, Quezon City (near Katipunan LRT Station). Gusto Kong manalo kasi super sarap ng mga food dito sa cabalen... Lalo na ang pinaka fav. Kong karekare..�������� #TravelEatPinas #Cabalen3Dekada #TrEaPhSaCabalen. Cabalen Restaurant is a place I would always choose when you are in a hurry since you don't have to order but just take your pick from the array of food served in buffet style and the variety is quite a lot and that's why I Would like to celebrate my birthday with my family in Cabalen because we love filipino cuisine especially there lechon, kare-kare and dinuguan. I want to eat at Cabalen because they offered a variety of Filipino Foods. I have been at Cabalen and they never fail me. Their food are delicious and tasty. #TravelEatPinas #Cabalen3Dekada #TrEaPhSaCabalen. I would love to win this treat as a post bday treat for me. My natal day is on 26th and having to dine and share it to my kid is a treasure I will never forget. Cabalen has been a part of almost all the special memories in my life. Me and my family have tried Cabalen and hearing 'Cabalen' again made me feel hungry. Cabalen's menu are very promising that is why I want to win the buffet passes. I can't wait to eat there again and I will definitely bring my wife with me. I am excited to eat again their the Crispy Kangkong and the delicious food like Kare-kare, Sisig, and Ginataang Kuhol. Actually, I really wanted to eat and try all. Also the Guinomis and Kakanin for desserts! Yum, Yum, Yum. I am in dire need to win the Cabalen's buffet passes because I am excited to eat again their staples like the delicious Kare-kare and Bulalo. I will not definitely miss the Tibok-tibok, Guinomis, shakes too. My hubby and I loves to eat and try different kinds of food, especially Filipino food. We enjoy each other's company when eating together and talking how the food we ate differs from each other. What is the best part of the menu, the service, the ambiance, the staff, and everything. And the best eat-all-you can we agreed is Cabalen, that is why we really want to go back and be filled again with delicious food.Our tummies are hungry and really craving now for Cabalen!